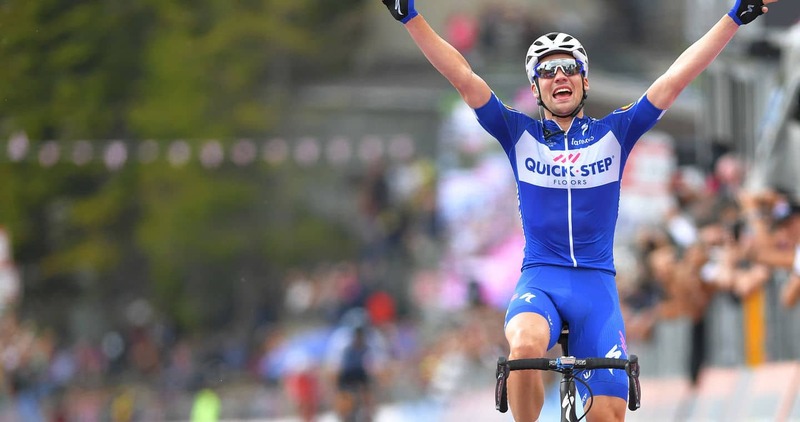 The 24-year-old captured the biggest victory of his career, Quick-Step Floors’ 80th Grand Tour stage triumph. Maximilian Schachmann put on a dazzling performance on the first summit finish of the third week and rode to a magnificent solo win on Pratonevoso – a 12.9km-long climb averaging 7.2% which featured in the race for just the third time in history – landing the 35th German success in the Corsa Rosa, one that came after a day that belonged to the breakaway, where Quick-Step Floors was represented by the second-year pro and Michael Mørkøv, one of the most experienced riders in the peloton. “I feel really amazing, it’s great to win a stage on my first Grand Tour. This is a really hard Giro, which makes it even nicer to be on top on such a stage. Michael played a big part in this victory, he’s my roommate at this race and a great rider, and what he did for me today underlines again our fantastic team spirit”, said Max, only the third German rider to win a summit finish at the Corsa Rosa, after Rudi Altig (1966) and Udo Bolts (1992). Many riders had the goal of making it in the break on the first stage of this week’s Alpine tryptich, and for that reason attacks came in quick succession soon after the start in Abbiategrasso, a move taking shape only after 30 kilometers. At the feed zone, the twelve men – which included Mørkøv and Schachmann – were 15 minutes clear and it became clear there were going to make it, especially as Pratonevoso, despite being a long ascent, wasn’t excessively steep.